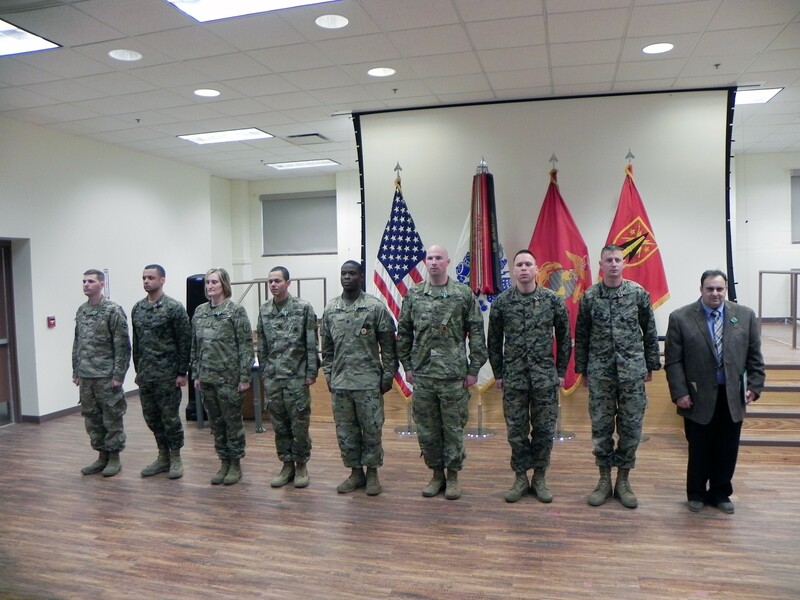 FORT SILL, Okla., Dec. 20, 2018 -- The Fires Center of Excellence, and Marine Artillery Detachment recognized instructors and curriculum developers of the year during a ceremony Dec. 13, at Burleson Hall. The honorees were: Capt. Andrew Roberts, 1st Battalion, 30th Field Artillery, FCoE officer instructor of the year; Marine Capt. Scott Betsher, MARDET officer instructor of the year; Chief Warrant Officer 4 Kristy Fair, Headquarters Detachment, FCoE officer curriculum developer of the year; Sgt. 1st Class John Owens Jr., 2nd Battalion, 6th Air Defense Artillery, FCoE NCO curriculum developer of the year; Staff Sgt. Keith Jackson, 1st Battalion, 78th Field Artillery, FCoE NCO FA instructor of the year; Staff Sgt. Garrett Nichols, 2-6th ADA, FCoE NCO ADA instructor of the year; Marine Staff Sgt. Robert Bielawski, MARDET NCO instructor of the year; Marine Staff Sgt. Ryan Eaton, MARDET curriculum developer of the year; and Benson Perkins, 3rd Battalion, 6th ADA, FCoE civilian instructor of the year. Officiating officer Col. David Stewart, FCoE and Fort Sill chief of staff, spoke about the importance of education. "We're here to train the Soldiers and leaders, and it all starts with the instructors and developers we're getting ready to recognize," he said. "I appreciate the fact that we're taking time out of our days to recognize our great Americans and professionals." Stewart recalled a previous instructor of his, Mr. French. "We were a bunch of young lieutenants. He had to take us, mold us, teach us, inspire us," Stewart said. "I remember him to this day. Thank you on behalf of all the students who have benefited from your instruction and course development. "If you've ever had the opportunity to instruct, to teach, when that light bulb goes off on your students, it's in their face, it's a profound effect, it's a special time, the passing of experience, knowledge and wisdom," Stewart said. "How do you know the difference between knowledge and wisdom? Knowledge is knowing a tomato is a fruit; wisdom is not putting a tomato in a fruit salad," the colonel said. 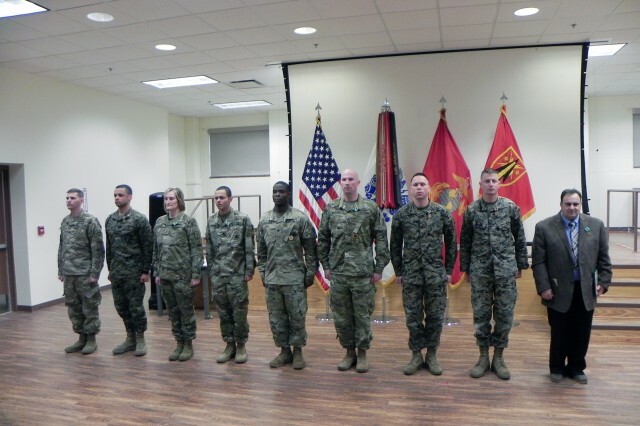 Recipients of the instructor, and curriculum developer of the year awards were nominated by their chain of command and must have demonstrated good leadership, values, coach, and mentor traits. Leaders from the ADA and FA schools and other representatives from FCoE including commanders, command sergeants major, and subject matter experts selected the winners, who also were nominated for consideration in Training and Doctrine Command's competition to be conducted in the spring. Nichols said educators have to bring their A-game every day. "Instructing is an everyday thing for us; we just have to be at the highest level at all times," said Nichols, who received email confirmation Oct. 11, of his nomination. He said he has been instructing three years. Jackson said being recognized as the FA instructor was an honor. "It's unlike any other achievement that I have had in my career," he said. "Although this was an individual award, it is very much an award that I give a lot of credit to my current and past leaders, mentors, and peers. "We as NCOs and leaders need to continue to make each other better, iron sharpens iron. We owe it to the students and our comrades to ensure that the caliber of Soldier that leaves AIT is ready and has the tools to be successful," Jackson said. "Good habits start here while they are IET (Initial Entry Training) Soldiers. We are the example, and they are the future. Our legacy lies within the students; that is the true reward."